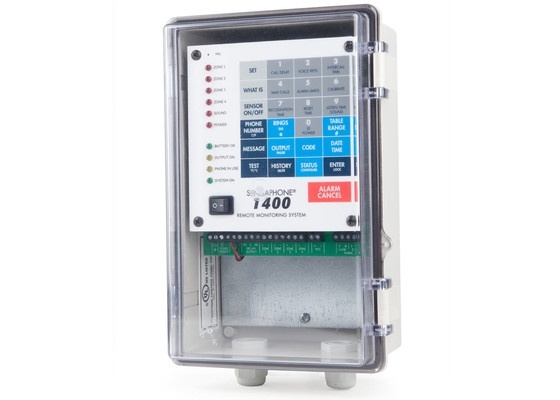 The Sensaphone 1400 Monitoring System offers a way to monitor up to four inputs. It's able to function in harsh conditions. The system includes dry contact, 2.8K, and 10K thermistor inputs. It also has 4-20mA support, allowing third-party sensor integration, including wireless sensors. Nonvolatile memory retains settings, programming, and logs. This memory remains even in the event of a power failure. The status of each monitored condition is easy to obtained at the unit’s installation site or by phone. Local Access Keypad and speaker for local programming. 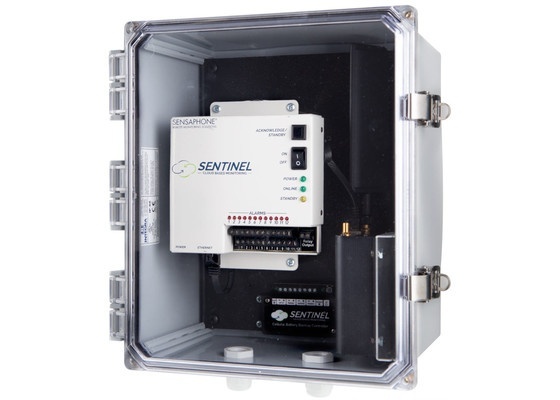 The Sentinel Monitoring System with Cellular Modem offers an easy-to-install, easy-to-configure monitoring solution for locations with no access to a landline or Internet connection. The Sentinel system monitors up to 12 different environmental and equipment status conditions including temperature, humidity, power failure and water detection. When the system identifies issues, it instantly sends alerts via phone, text or email over a cellular connection. It can also deliver daily event reports, and provide audit logs. Users can access information and make system changes from any web-enabled device. The system stores all readings in the cloud, which protects against data loss, provides unlimited information storage and allows multiple devices to be managed from one account. No software is required, so installation, integration and management. 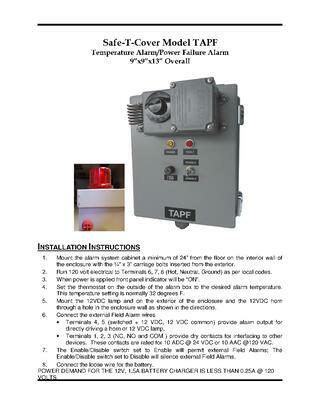 This alarm consists of a painted NEMA-12 rated cabinet, 12VDC battery, AC battery charger, relays, 90 decibel horn, strobe light, thermostat and the temperature sensor. 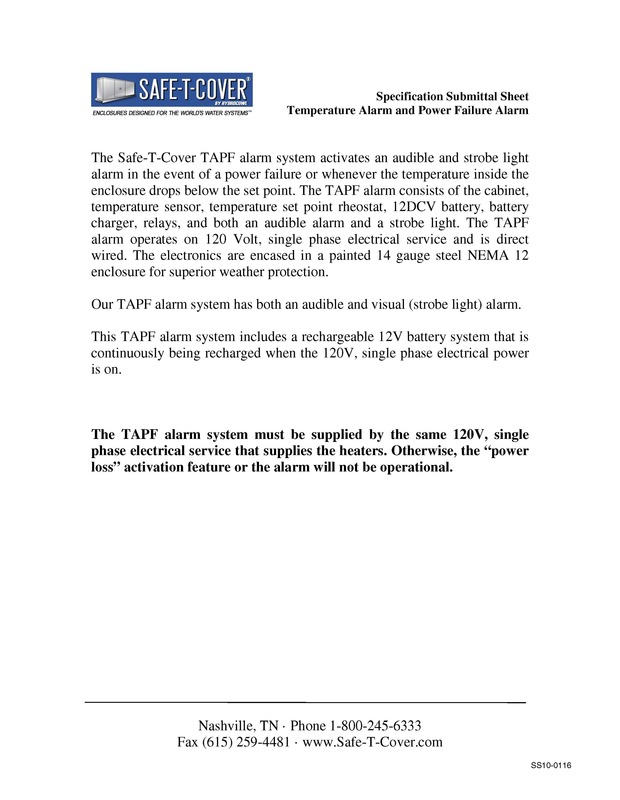 This alarm is designed to activate both the vision strobe light alarm and the audible alarm if either the enclosure loses power or if the internal temperature falls below the thermostat’s set point. The owner sets the temperature set point. Extra contacts are provided to interface with other devices. This alarm is direct wired into 120 volt, single phase electrical service. Both of the alarms run off a 12 volt DC battery. The 120 volt AC electrical power keeps the 12Volt DC battery system recharged. 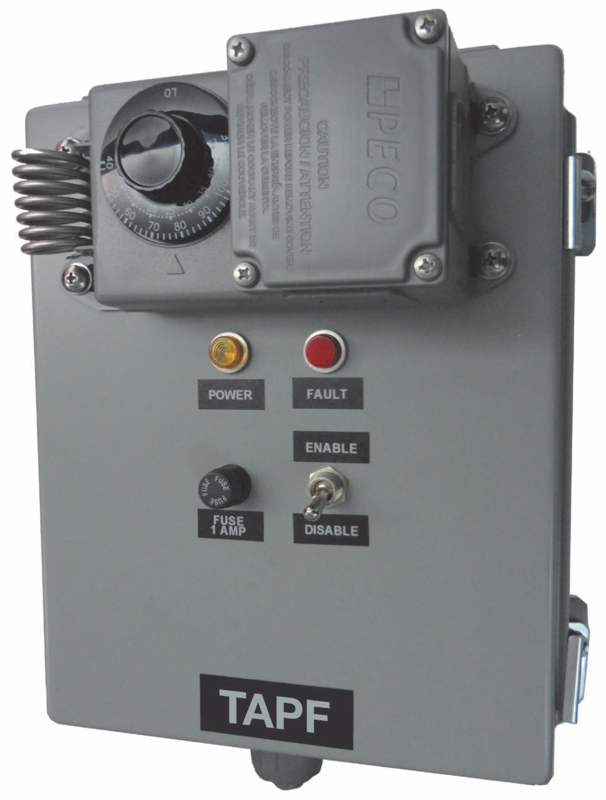 The electronics are encased in a painted, 14 gauge steel NEMA-12 enclosure for superior weather protection. 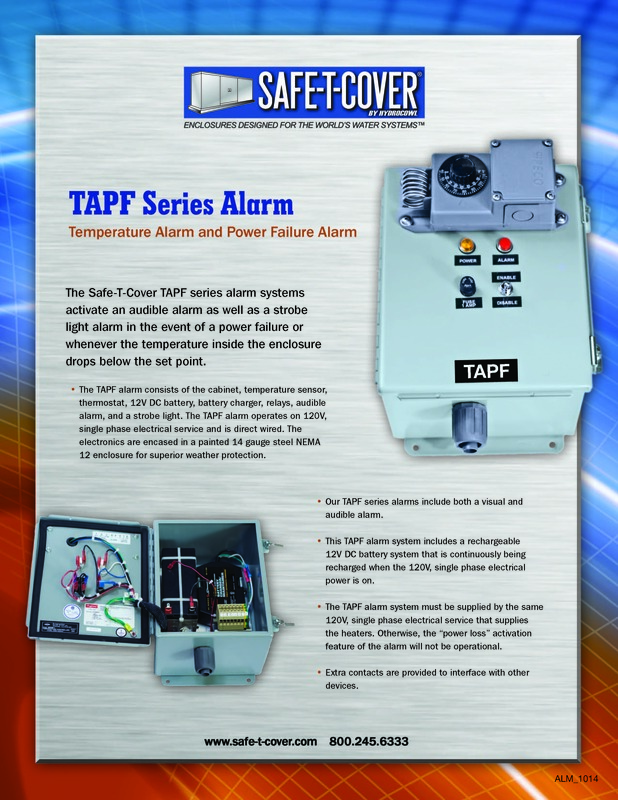 The TAPF alarm system must be supplied by the same 120V electrical service that supplies the heaters. Communication Method Audible and strobe light alarm. This alarm also has extra contacts to interface with your control room. Contacts Dry contacts are rated for 10 ADC @ 24 VDC or 10 AAC @120 VAC. Alarm Locations Audible and strobe light alarms are attached to the outside of the enclosure.